Project Perfect Mod :: View topic - Maniac's Armed Recreational Vehicle! Posted: Sun Nov 02, 2008 6:09 pm Post subject: Maniac's Armed Recreational Vehicle! 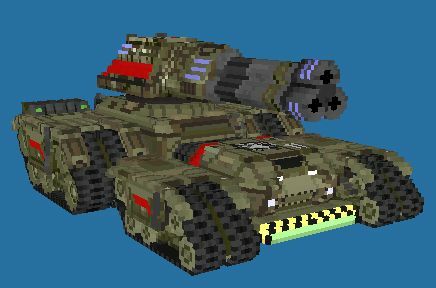 I have created this voxel specially for PPM Voxel Competition 2008 and this pack contains Soviet schemed version of the MARV (I have recolored it then), normal GDI MARV (no upgrades) and bunkerable version of the GDI MARV (multiple turrets would look lame because of the game engine). Also this pack includes 2 cameos of normal GDI MARV (non-veteran and veteran). love it! Spotlight it fast! EDIT: Soviet scheme with bunker please! Well, maybe later I will make soviet scheme with bunkers, I am pretty busy with my Uni (half-semester exams and projects like cipher program in the C with parameters key and help) now. How can I make sov scheme? Just a recolor or did you do lots of modifactions? Well, I think you need to recolor Brown1 and Brown2 colours to Soviet colours. Parts which I haven't change are Greyscale, Allied, Green, Dark, Remap colours. I don't think it will be just simply pallete conversion, rather colour-to-colour conversion. You can try. Is it me or it can't fit through the war factory doors? I suppose the actual and only way people will make these in their mods is by using kennel hack powered reclamator hubs. Wooooo. I'm gonna hand paint normals on this voxel when I have some time to mess around. Making it a base destroyer and Masstodont Tank destroyer. 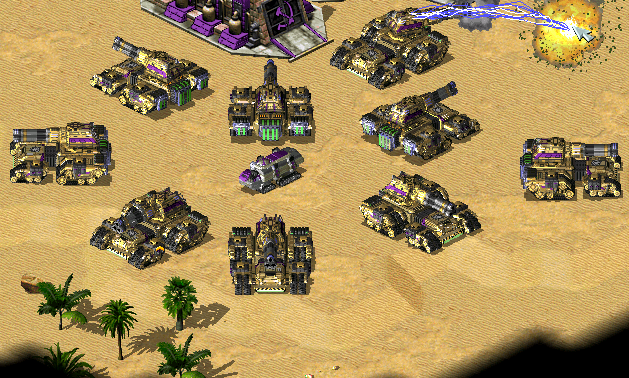 scary looking tank, it design looks accurate like in KW M.A.R.V, excellent work dude. Wouldn't be a MARV without the MARV voice One of the better voices in Kane's Wrath these are extracted MARV sound files which I've named each file after its voice lines. Just to make it more fun when you take this MARV out for a spin in your mods. Since this was ranked top 3 at the competition I consider spotlighting would be enough good prize from me. It's too big. isn't it? How could it ran out of WF? If only it was a spinning barrel, then this would be a Mega Spotlight. can be done... kinda, it'd mean making a few extra turrets with barrels at various stages of rotation then using the SREF turret changer abuse. There's a better way to animate the turret. Just like the gattling tanks does. This is also possibility (I am thinking about it). But I am too busy this month (exams), maybe later. I will improve the texture and make those barrels spinning - maybe like the Prism Tank (turn after shot), maybe like the Gattling Tank (s-l-o-w-l-y spinning while shooting). @Jon Fox: You (and everybody) can do anything you want with this, but give me credit. Sure thing. I find it best to ask before use.